Kaiser's Bar-B-Q brings Lone Star tradition to the Beehive State. For those of you who are under the impression that barbecue is a Saturday spent grilling burgers over a propane-powered grill, it's time to set the record straight. True barbecue—or BBQ, as it will hereafter be designated—is one of the few true American art forms, and it deserves more respect than it gets from these weekend grillers in their "kiss the cook" aprons. Before respect comes understanding, however, and Kaiser's Texas Bar-B-Q & General Store (962 S. 300 West, 801-355-0499,) should be high on any truth-seeker's curriculum. Upon cracking open the smoke-filled drum of American BBQ culture, it doesn't take long to see that it's as complex and nuanced as any cultural phenomenon. Once I began my foray into this competitive world, I found myself increasingly drawn to the Texas perspective—they're all about brisket, and don't waste time with well-guarded dry rub recipes. If that's the kind of down-to-earth outdoor smokery you're in the mood for, Kaiser's has a juicy bone to pick with you. Kaiser's looks and feels like owner and Texas native Gregg Chamberlain scooped up a block of his native town of Boerne and transplanted it to Salt Lake's Central Ninth neighborhood. Its bright red exterior hides a delightfully ramshackle operation—the kind you'd find on an out of the way stretch of road deep in the heart of the Lone Star State. The interior consists of a few picnic tables—expect to get cozy with your neighbors at lunch time—and a menagerie of hand-made wall art. Everything from rusted horseshoe sculptures to welded metal roosters can be found plastered across the perimeter. You know you're in a BBQ place worth its salt when the aroma of smoked meat hits you long before you get a chance to take a look at the menu. It's a solid marketing tactic—once you enter, you don't really want to leave until you try what Chamberlain has cooking. For lunch, you can't go wrong with a Kaiser's Hillbilly Hamburger ($9), which is a juicy pile of sliced brisket sandwiched between a hamburger bun struggling to maintain its structural integrity. Texas BBQ purists will want to chow down on this beast without Kaiser's sauce—but either way, it's smoked and carved to perfection. The joint also offers combos that let diners mix and match ribs, brisket, pulled pork, chicken and sausage, which I strongly recommend. I went with a two-meat combo plate ($15.95) with ribs and sausage. I've never been one to scoff at a good dry rub, but there's something elegant about a rack of ribs that hasn't been prepped with anything but salt and black pepper. Such a sparse seasoning strategy is indeed gutsy—it puts the meat's flavor and the pitmaster's smoking acumen front and center. I'm a fan of this minimalistic approach, and Chamberlain knows what he's doing. The ribs are tender, but not so much that they don't offer any resistance. With or without the house sauce, these, my friend, are winners. One thing many people don't know about BBQ as an art form is that a lot of its technique was culled from the influence of German immigrants. This is the biggest reason that smoked sausage shows up on the menu, and it's always been one of my BBQ staples. The smoked sausage at Kaiser's is generously portioned—one link could cause serious blunt-force trauma—and damn, is it good. It's got the characteristic snap of a sausage made with authentic casing (guts), and packs a pleasant punch of black pepper and garlic with its natural flavors. 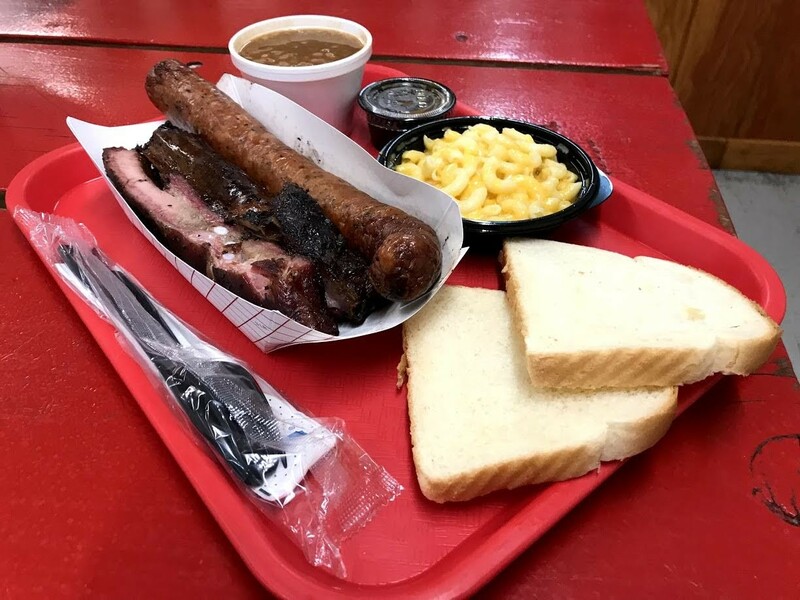 Like most authentic Texas BBQ spots, Kaiser's also sells its meaty menu items by the pound—perfect for either casual weekend get togethers or, for the true seekers among you, finding pure BBQ enlightenment. Open: Tuesday-Saturday, 7 a.m.-7 p.m.